Scholarly discussions on economic development in history, specifically those linked to industrialization or modern economic growth, have paid great attention to the formation and development of the market economy as a set of institutions able to augment people’s welfare. The role of nonmarket practices for promoting economic development and success has been an area of interest, typically involving discussion of the state’s economic policies. How have societies tackled problems that the market did not handle well? To what extent did their solutions reflect the structure of their economy? 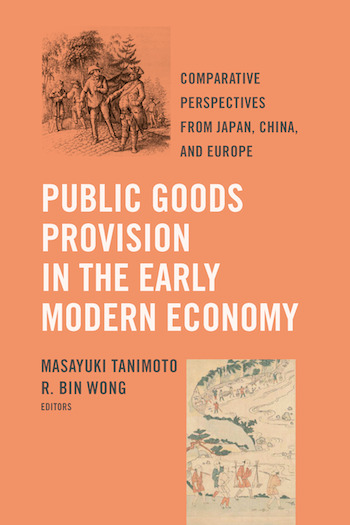 Public Goods Provision in the Early Modern Economy explores these questions by investigating efforts made for the provision of “public goods” in early modern economies from the perspective of Japanese socioeconomic history during the Tokugawa era (1603–1868), and comparing those cases with others from Europe and China. The contributors focus on three areas of inquiry—welfare policies for the poor, infrastructure, and forest management—to provide both a unique perspective on Japanese public finance at local levels and a vantage point outside of Europe. The book seeks to encourage a more global view of the early modern political economies that shaped subsequent modern transformations. “With new global evidence that goes well beyond the timeworn topics of taxation and military spending, Public Goods Provision will make historians and social scientists rethink the development of fiscal systems, the history of public spending, and the long-run pattern of political and economic development.” PHILIP T. HOFFMAN, author of Why Did Europe Conquer the World? MASAYUKI TANIMOTO is Professor of Economic History at the University of Tokyo and editor of The Role of Tradition in Japan’s Industrialization: Another Path to Industrialization. R. BIN WONG is Distinguished Professor of History at the University of California, Los Angeles, and coauthor of Before and Beyond Divergence: The Politics of Economic Change in China and Europe.